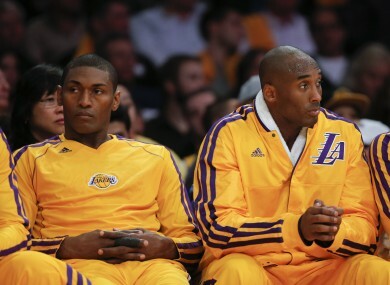 Los Angeles Lakers' Kobe Bryant, right, and Metta World Peace on the bench. THE LOS ANGELES Lakers have been handed back-to-back losses to start the NBA season despite a huge player outlay in the off-season. The Lakers were beaten 116-106 by the Portland Trail Blazers at the Rose Garden a day after going down to the Dallas Mavericks in their home season opener. Prize recruit Dwight Howard finished with 33 points for the Lakers while ex-Phoenix Suns star Steve Nash could muster only two points from limited game time. Nicolas Batum (26 points), Wesley Matthews (22) and Damian Lillard (23) – the sixth pick in the June draft – took advantage of an incoherent Lakers side. Debutant James Harden stole the show with 37 points in the Houston Rockets’ 105-96 win over the Detroit Pistons. After penning an $80-million five-year contract with the Rockets from Oklahoma City four days ago, Harden was unstoppable as he helped turn around a nine-point deficit early in the fourth quarter to get the Rockets over the line. Harden also had 12 assists and Carlos Delfino hit four three-pointers in the last quarter to lift the Rockets. The Chicago Bulls defeated the Sacramento Kings 93-87 without injured star Derrick Rose as Joakim Noah stepped up with 23 points and 10 rebounds. Richard Hamilton added 19 and Carlos Boozer 18 for the Bulls, who signed Taj Gibson to a long-term $38-million contract extension not long before the deadline prior to the game. A day after stunning the star-studded Lakers, the Mavericks were nowhere near that level in a 113-94 loss to the free-wheeling Utah Jazz. Mo and Marvin Williams top-scored for the Jazz with 21 points apiece after they had set up the win with a 37-13 third quarter. Tony Parker rescued the San Antonio Spurs with a three-pointer with 46 seconds to play among his 24 points as they defeated the New Orleans Hornets 99-95. The Indiana Pacers saw off a new-look Toronto Raptors outfit on the road with a 16-4 run in the fourth quarter to cap off a 90-88 win. The Denver Nuggets had five players in double figures as they pulled away from the Philadelphia 76ers 84-75 in both sides’ season openers. The Golden State Warriors edged past the Suns 87-85 despite a woeful evening from Stephen Curry, who finished with five points and two-of-14 from the field after signing a new deal. Email “Lakers fall to 0-2 as Harden stars in Rockets debut ”. Feedback on “Lakers fall to 0-2 as Harden stars in Rockets debut ”.